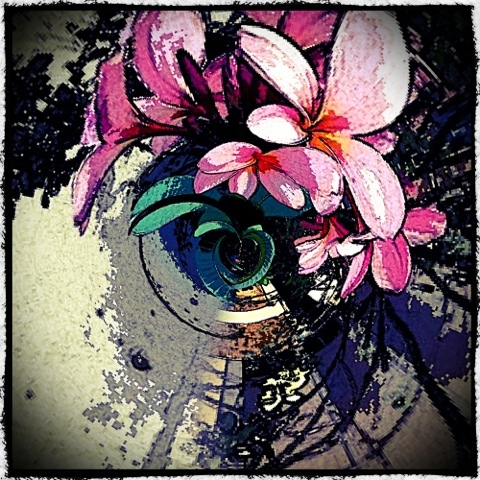 This frangipani was taken using PaperCamera, then put through Tiny Planets to give it a swirl. After browsing through PhotoToaster, I chose "Angry Pants" to finish it off. How could I go past such a name? It's getting a little bit pricey reading your blog! LOL I love the Paper Camera app, and know that TinyWorld and PhotoToaster are going to be great fun as well! Thanks for more eye opening! Hi! I just looked at your pics...they are wonderful! And yes, I think you need to do more!!! Love how you used Paper Camera and Tiny Planet in this one!! I'm tickled by Judy's comment about it "getting a little bit pricey ready your blog".....knowing I'm, in part, the cause as well! What fun!! That picture is a gem. Thank you. I love this, and congratulations on winning Seth's piece. Judy, I love what you've been doing with PaperCamera. I love it too. Dave, Ah, yes, it's all your fault, but I'm not complaining. I'm learning so much from you. Dear EC, I'm so pleased you like it. Thank you. Barry, apart from Dave, you were my original inspiration to start using my iPhone in this way. Many thanks. Roxanne, thank you for the congratulations and your appreciation for the photo. This one is sensational Carol. I have Android so can't join you in these App pursuits. Thanks Wendy, I expect Androids will have to produce some apps soon.